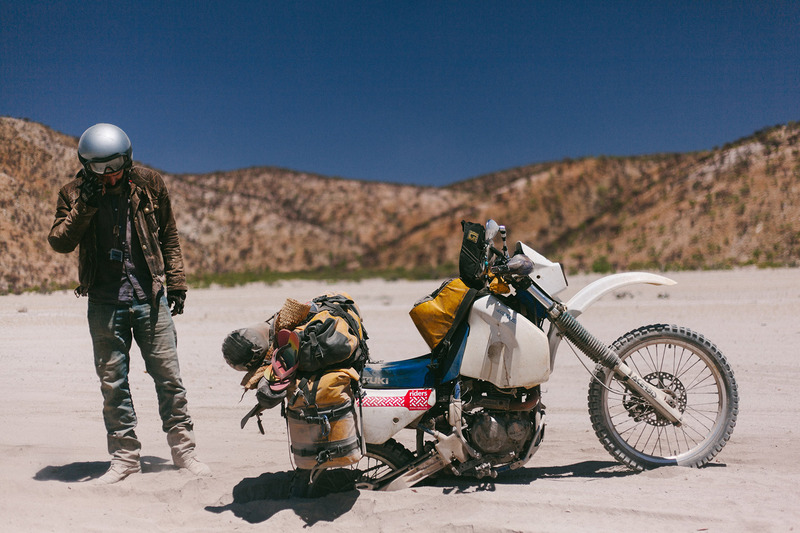 We aren't your typical hard-core adventure motorcyclists; we don't know much about fixing bikes, we don't have the right kit and we don't really have enough money. Just as an example of our incompetence: Chris, after a catastrophic first attempt, only scraped through his motorbike test two weeks before our departure date. Having said this, what we do have is a naively large amount of optimism and an abundance of enthusiasm that was to see us through to South Africa. The opportunity for this trip arose when we found ourselves all eager to escape our jobs, we each had saved a feasible amount of money, and we were free from any other commitment that could hold us down. It wasn't absolutely spontaneous but neither was it completely premeditated. 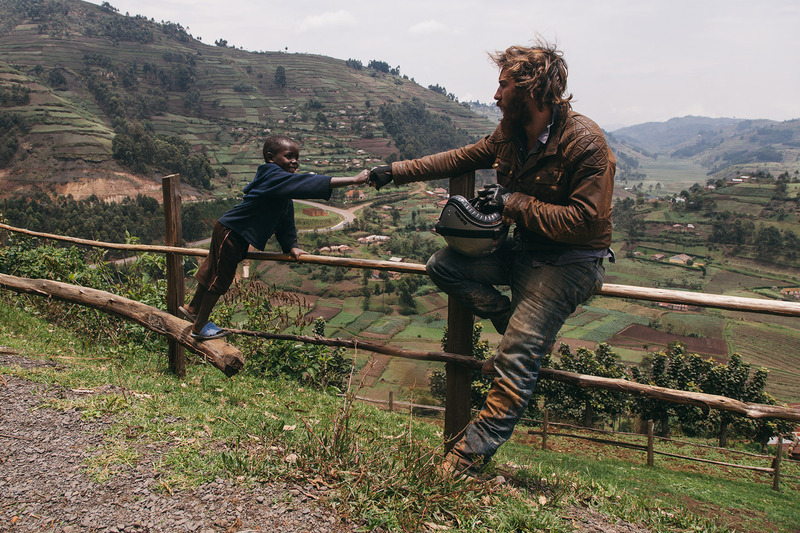 The seed of this trip had been planted long ago but none of us saw it coming into fruition until we were more or less saddling up our bikes. The plan was to travel from Edinburgh to Cape Town in six months while exploring as much of the African continent as possible. The challenge itself, while incredibly enticing, was not the main draw for us. We are all exceedingly interested in other cultures and coming from Europe we couldn't really find anywhere more foreign than Africa. We were not disappointed. As expected, the differences were evident as soon as we crossed the Mediterranean and every country provided a new and wonderful world. Nothing however could have prepared us for the vast array of people, beliefs, cultures and languages in each individual country. We did our best to explore every inch but it would take a lifetime to fully appreciate places such as Uganda which homes more than 40 different indigenous ethnic groups. Africa has so much to offer culturally and has an incredibly diverse countryside. As a result it took an extra four months for us to make it to Cape Town. The first hurdle we faced was a brutal European winter. We were racing through Europe as quickly as we could but the weather was fighting against us. 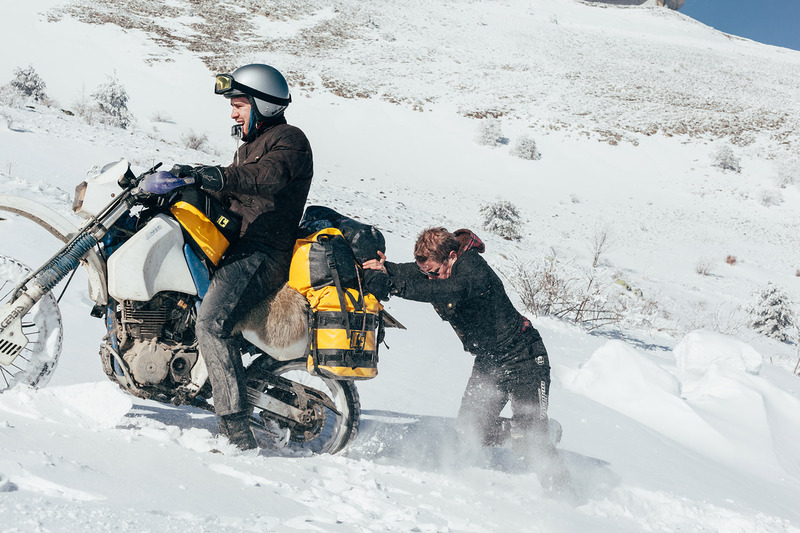 Packing with Africa in mind left little in our panniers to cope with snow. We had one night in the German wilderness where the temperature dropped to -10°C. We wore absolutely every item we had and still couldn't feel our toes in the morning. Chris particularly suffered in his summer season sleeping bag with recommended temperature between 25 to 10°C… Along with camping, a mixture of friends and welcoming locals meant that we only had to pay for one night's accommodation throughout the first week. Despite the rush and weather it was a really nice start to the trip. Regardless of our determination to keep moving we often found ourselves stranded by the weather or distracted by some of the amazing European sights. In this case it was a bit of both. The Buzludzha Monument for example was built by the Bulgarian communist regime to commemorate the events in 1891 when the socialists, led by Dimitar Blagoev, assembled secretly in the area to form an organised socialist movement. It was opened in 1981 for 20 years until the fall of communism in Eastern Europe. No longer maintained by the Bulgarian government, it has fallen into disuse. We didn't actually make it to the building the day that we arrived as the snow got the better of us. After an early-morning climb we finally made it to the top. In our overexcited states it took us a good deal of time to notice that the doors were securely barred and there was certaÄ±nly no obvious way in. Fortunately we found a small gap in the communist defences and managed to wriggle our way inside. Egypt was a welcome change after the crippling cold of Europe. Following some tricky negotiations across the border we wasted no time getting into the desert. Throughout the trip we were incredibly lucky in meeting welcoming and generous locals to take us under their wing, none more the case than our Egyptian friend Omar. He took us out for a weeklong expedition through part of the Sahara desert, which wouldn't have been possible without his support. Egypt's Western Desert offers the stereotypical sandy desert along with so much more. There is the White Desert with a scattering of giant paper-white natural sculptures, the Black Desert with its endless volcanic plains that look like post-apocalyptic world, and of course the occasional Oasis to find refuge in. Every turn in the Western desert provides a completely new world. The colours, shapes and materials are constantly changing from one extreme to the other. 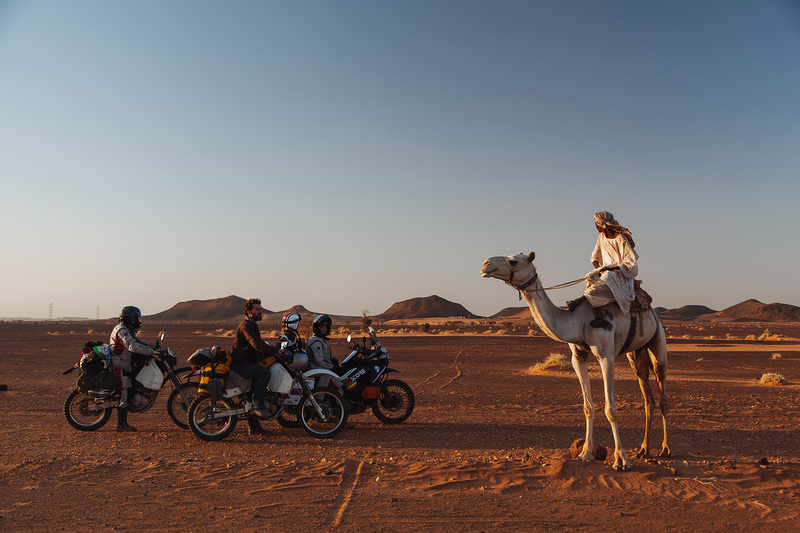 Only a true Bedouin could navigate these deserts without aid. Thankfully we had Omar with us. Our first desert exploration came at a cost. The excitement of the sand-dunes got the better of us resulting in a broken collarbone for Archie B. We gawped in amazement as Archie B rocketed up the sand dune with no knowledge of what lay over the peak. We suspected the worst as our fearless friend silhouetted on the sun. Bike and rider soared through the air for roughly 12 feet before touching down. The pair didn't share the impact evenly as the bike sank softly and Archie B slapped into solid sand. He scrambled to his feet with a triumphant smile only to instantly collapse again in a dizzy mess. Friends were near at hand and we quickly searched for aid in the endless desert. Fortunately we found help at a nearby oil pump that prepped him with medication and, oddly enough, an incredible strawberry milkshake for the long ride to the hospital. Bike and rider soared through the air for roughly 12 feet before touching down. Sudan has long been beset by conflict and has never really been painted with a positive image in the media. We try to keep an open mind about all countries but we couldn't help be slightly anticipant when entering Sudan. Our presumptions could have not been further from the truth. This was by far the friendliest country that we passed through. The locals we met, who were clearly struggling to feed their own families, would generously offer us bread and tea while refusing anything in return. The kids were especially interested to meet us and Archie B often found himself acting Mother Duck. 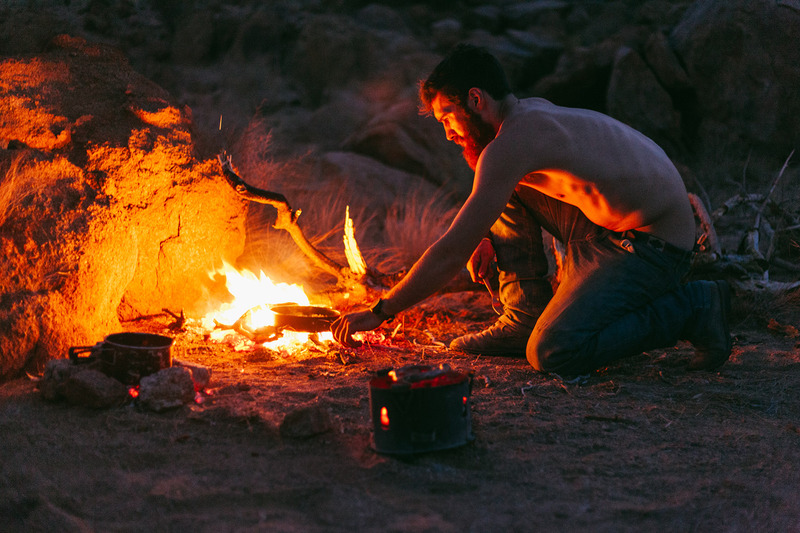 Camping in the desert is one of the most incredible experiences you can have. 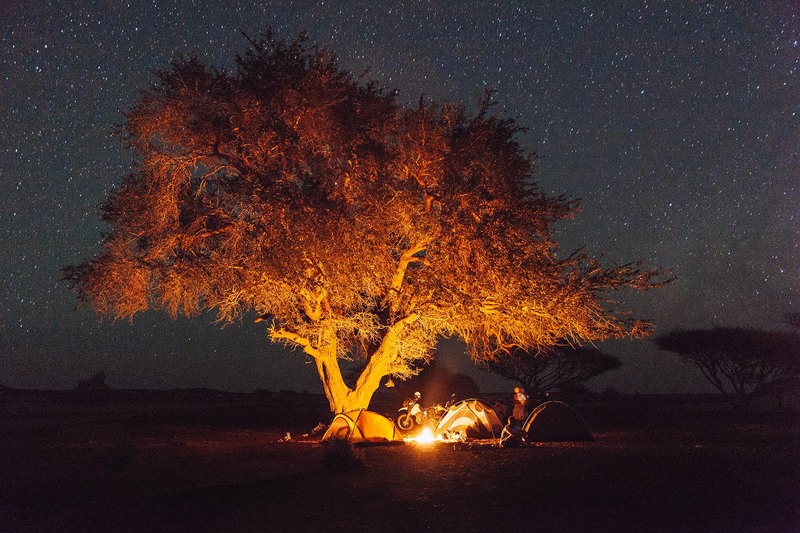 We set up under this solitary tree with the most perfect night sky imaginable, knowing there was not a soul for miles besides the desert foxes. You have to check your boots for scorpions in the morning but other than that it's the most peaceful experience in the world. Our route through Sudan ran alongside the Nile pretty much all the way to Khartoum. There were a variety of crossings, this one being the most exciting. This boat sported a placard stating that it was built in England by The Rowhedge Ironworks Co. Ltd. in 1953. Many boats brought to Africa during the British colonisation are still used throughout the continent. It's both a testament to British engineering and African resourcefulness. The difference between Ethiopia and Sudan were evident immediately. The barren sandy plains transformed to green hilly landscape as soon as we crossed the border. Even after entering Ethiopia the Sudanese thorns were still taking us down and judging from this locals' expression we had learnt little from our previous punctures. Again the kids were incredibly curious and we often found ourselves swarmed even at brief breakdowns. This wonderfully windy road turned out to be some of the most enjoyable stretches of driving on the trip. Between the bumps and winds we just about had enough time to appreciate our first taster of the Tigray region. This magnificent mountain range was swathed in a green and brown envelope that proved a refreshing change from the endless sands of Sudan. Further down this road we were soon to learn the true nature of the rains of Africa. Rainy season in Ethiopia works like clockwork. Every afternoon, without fail, there would be a thunderstorm. This particularly storm had us cowering in our tents by 5pm. The climate proved to be as turbulent as our bowels for the first few months in Africa. Yet again we found ourselves at sub-zero temperatures as we climbed The Simien Mountains. It took us a gruelling 3-days to climb to the top of Ras Dashen, the highest mountain in the Ethiopia and the 4th highest peak in Africa at 4549m above sea level. It was an incredibly rewarding experience and yet again the scenery, people and diverse wildlife did not disappoint. 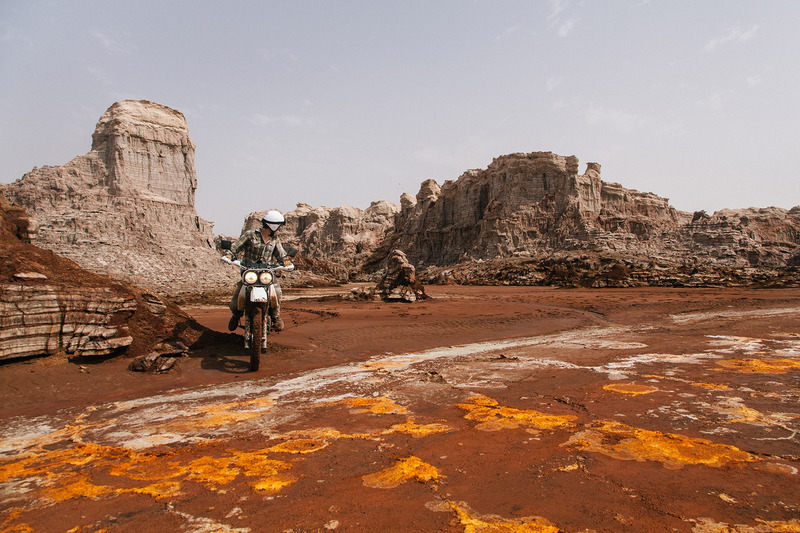 The Danakil Depression is one of the many incredible environments that Ethiopia has to offer. 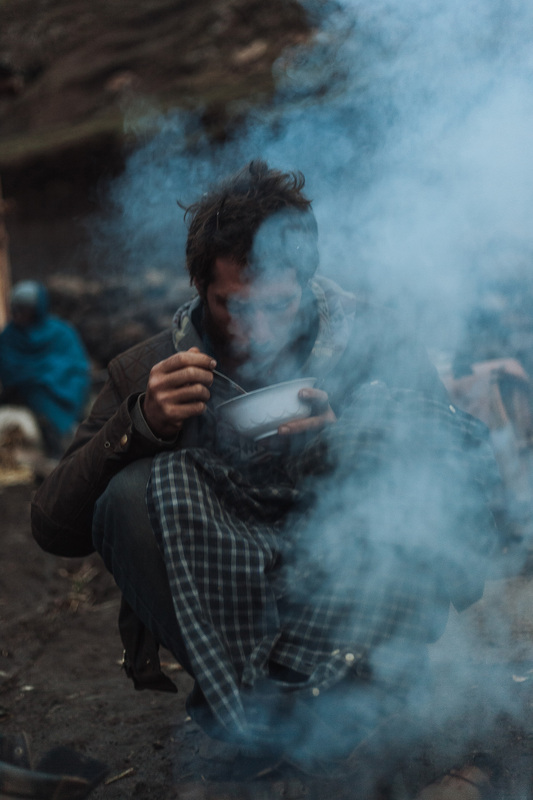 It is considered to be the hottest place on earth and at first glance could be mistaken as a barren wasteland, however there are some unbelievably resilient people living out there. It was shocking enough to find life but then to discover this village positioned at the bottom of an active volcano was something else. It really made us reconsider what we take for granted on an everyday basis and pretty ashamed of some of the "first world problems0 that we struggle with. 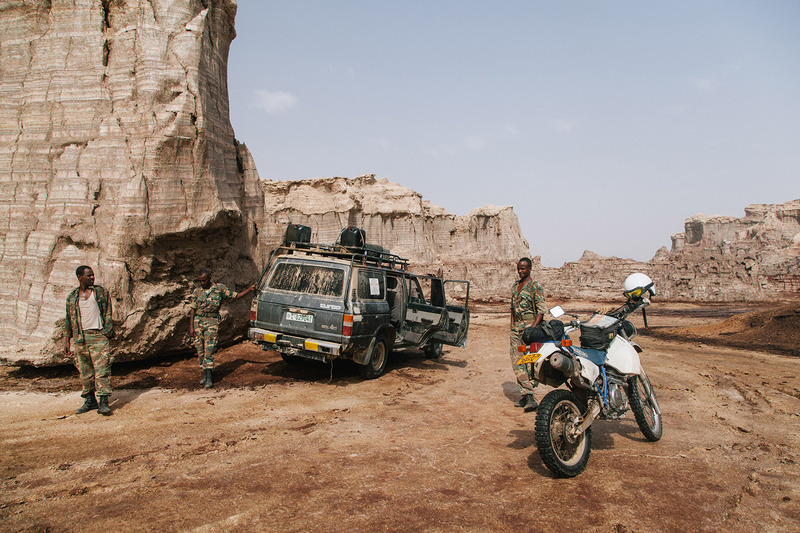 Recent trouble from roaming Eritrean bandits has resulted in a military presence near the border and the government now requires that tourists be escorted. 14 soldiers seemed slightly over the top for a ragged band of travellers like us but we were happy to have the company and enjoyed the endless games of checkers. 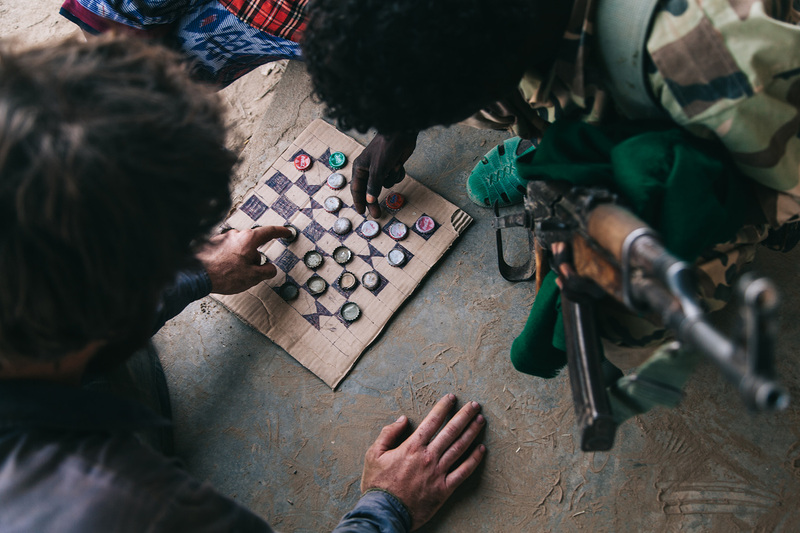 We enjoyed endless games of checkers with the Eritrean soliders. The Danakil Depression could easily be mistaken for another planet with its strange salt mountains and multi-coloured sulphur pools. Every sense was assaulted by the extremes of the sulphur fields. The area was filled with hissing and bubbling as the sulphur escaped the surface before assailing our nostrils. The surrounding colours would not be considered natural in any other situation- the ground was covered with oranges, yellows, pinks, purples and all other sorts of alien colours. A truly other-worldly experience. This was perhaps the toughest challenge we faced on the trip. Each change in the terrain brought on new obstacles. With tyre-shredding dried mud/salt, acid pools, sulphur fields, acacia bushes, deep sand and a volcano to compete with it's a miracle we survived without any injuries or bike problems. After 16 hours of intense off-road riding, 6 hours of hiking and only a 2 hour sleep-break its no surprise we didn't last long once we got back to the army base. The 50°C temperature didn't help either. After 16 hours of intense off-road riding, 6 hours of hiking and only a 2 hour sleep-break its no surprise we didn't last long once we got back to the army base. Lake Turkana is one of the most remote regions in the world. Even before we were anywhere near the waters edge it was clear that this was a unique and untouched setting. The lake passes from southwest Ethiopia, through the Sibiloi National Park and into the Kenyan Rift Valley. 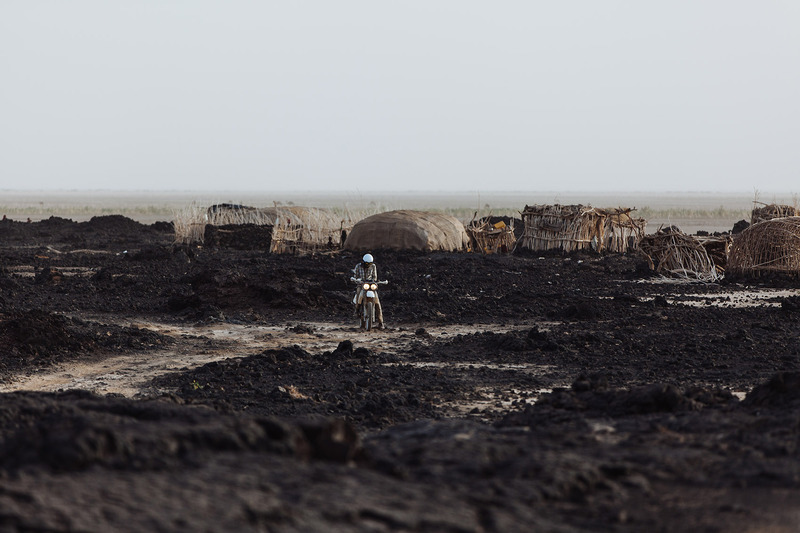 Turkana is both the largest permanent desert lake and the largest alkali lake in the world, providing a harsh environment to travel through, let alone live in. The area is so underdeveloped that there is no boarder controls besides a thin stretch of rope to mark the country divide. 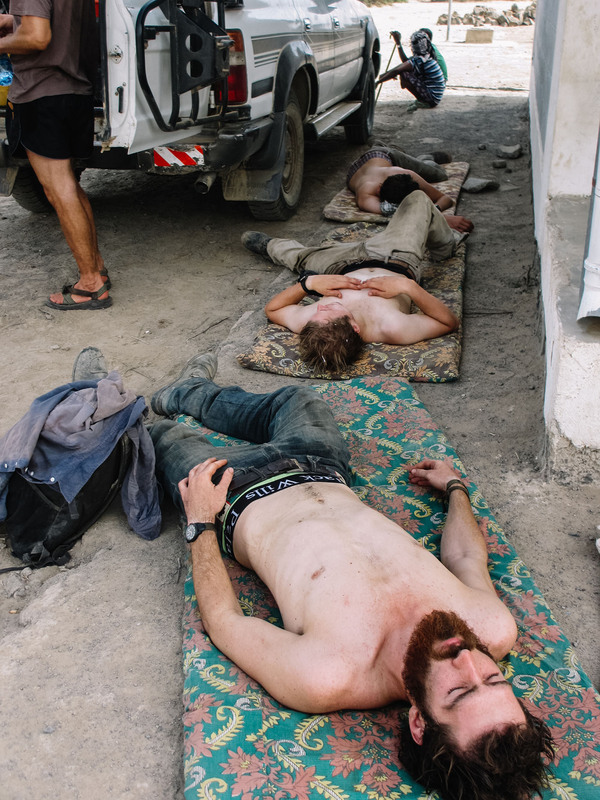 These scantily clad locals are as close to customs control as you will find. 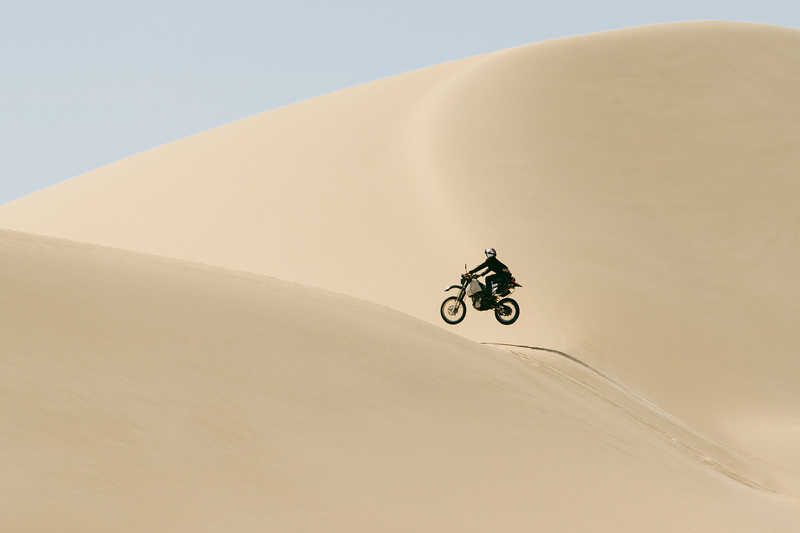 Who needs a guided safari when you have a DR350? After only a week we were able to tick of a fair few of the major African wildlife. Unlike the inquisitive giraffe and shy antelope some of the elephants were less than pleased to see us. Chris had a fairly close encounter with one such displeased male. The Archies managed to calmly cruise passed the angry male keeping their composure however Chris was another story. The trumpeting giant sent Chris into a panic causing him to stall right in the elephant's warpath. A series of frantic kicks starts, echoed by the elephant's stomps, eventually got Chris out of dodge and rocketing in the other direction. 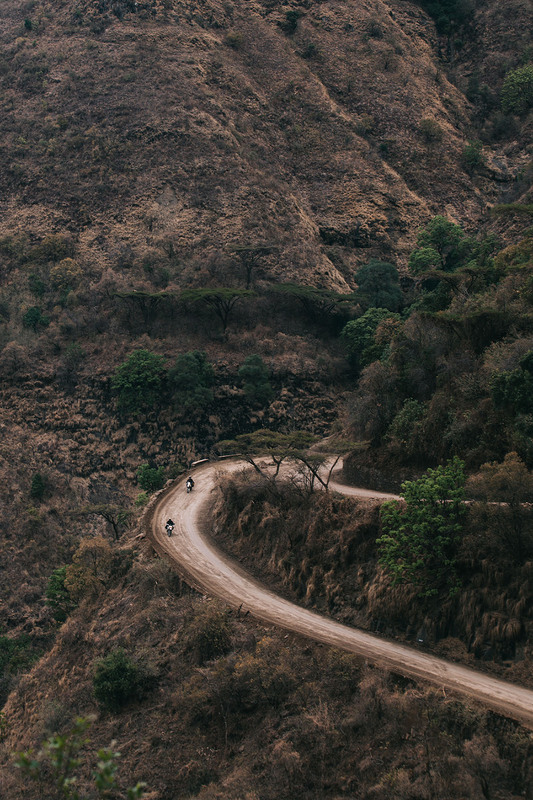 Despite this nerve-racking meeting the Kenyan countryside was incredible to ride through and abundant in wonderful exotic wildlife. It went one of two ways with locals, either they sped towards him shouting "Jesus how are you?0 or they fled for their lives as they mistook him for a roaming gorilla. The latter was often the initial reaction from children but occasionally we found a kid brave enough to stretch a fist bump from a safe distance. This was a river crossing we couldn't quite manage ourselves. The locals assured us that this "ferry0 could take the weight. We were less than certain but the abundance of bridges dictated our decision. 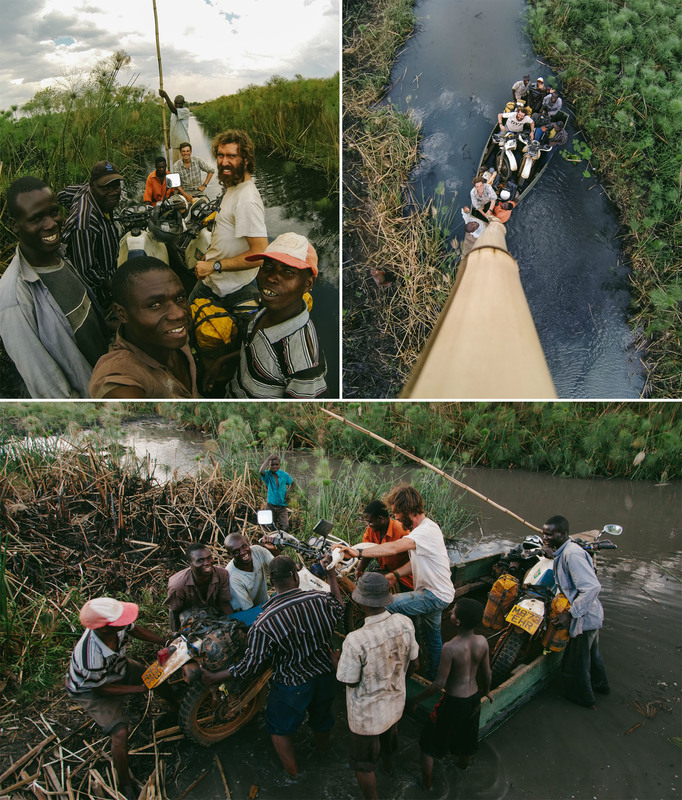 With the weight of the bikes alone the boat was taking on an alarming amount of water but nevertheless nothing could dissuade the locals from riding with the Muzungu. The Okavango Delta is one of the largest inland deltas in the world and creates a 15,000 square kilometre sanctuary from the surrounding Kalahari Desert that the Botswana wildlife flocks to. Elephant are one of the few animals that you can spot above the reeds and so you have to be really careful not to stumble across creepy crocs or hangry hippos. Still slightly sheepish from previous Hippo encounters, Chris and Archie L were especially careful to listen out for their unmistakable grumbles. Our number one priority in Namibia was to visit the Himba tribes. 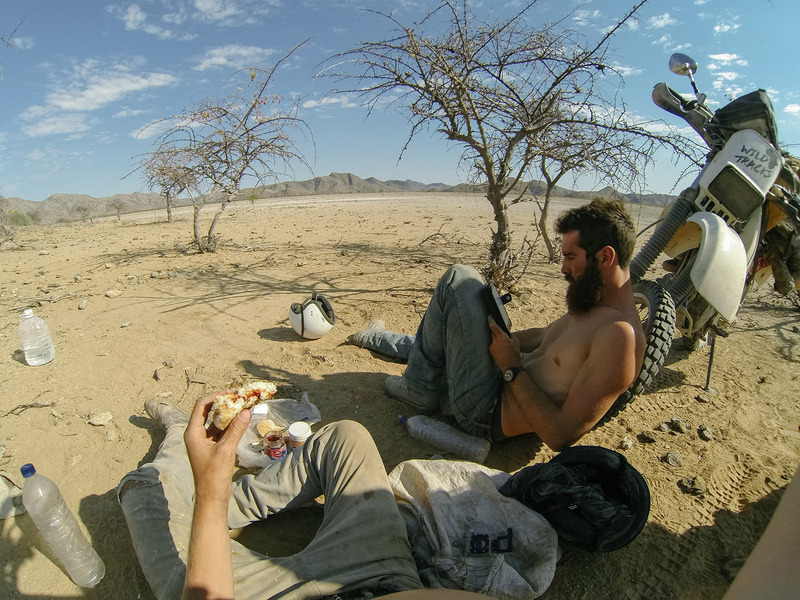 This was no easy feat as the Himba live in the most remote region of Namibia and so we prepared the bikes for a lengthy stay in the desert. 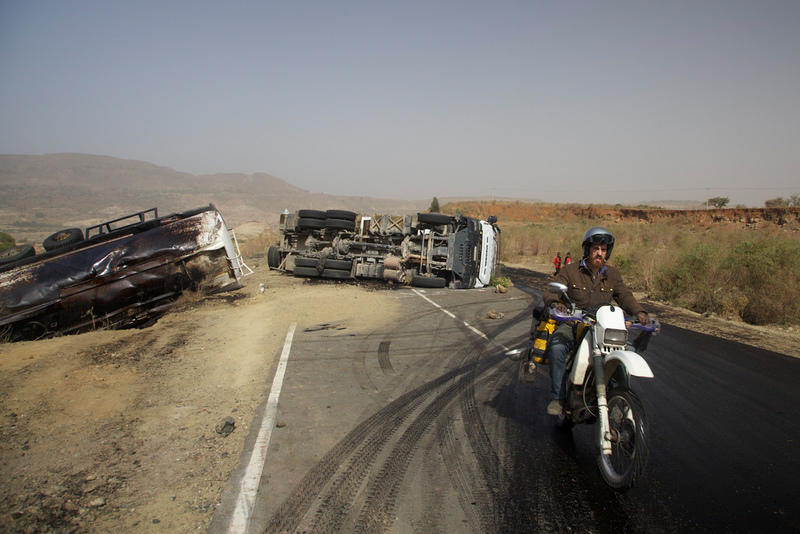 The roads somehow managed to get worse as the sand turned to a very thin dust that strangely enough acted like water. Perplexed by the contradicting road surface. After a long day travelling through Namibian history we set up camp just below "the White Lady0. Finding the right firewood in Namibia is imperative. Wood from the Tambuti tree releases toxic fumes when burnt that can contaminate food cooked over its' flames. Unfortunately Tambuti wood is easily mistaken for regular firewood and so you have to either be extra careful or extra lucky. We put extra care into picking the right firewood for this meal as a village stop had blessed us with Meat, Potatoes and Beans. With meat largely off the menu we had stopped carrying a grill. Fortunately we did hold on to our master engineer, Chris, and he managed to quickly fashion a make-shift grill from electrical wire. Just wanted to say I loved your story! Great write up and pictures. . What can I say, typical Scots attitude. . .”lets just wing it “. .from a fellow ‘Jock’. Well done on the trip of a lifetime. I greatly appreciate what you did and respect you for doing it. Good adventure, everyone who likes to travel works live trip like this. 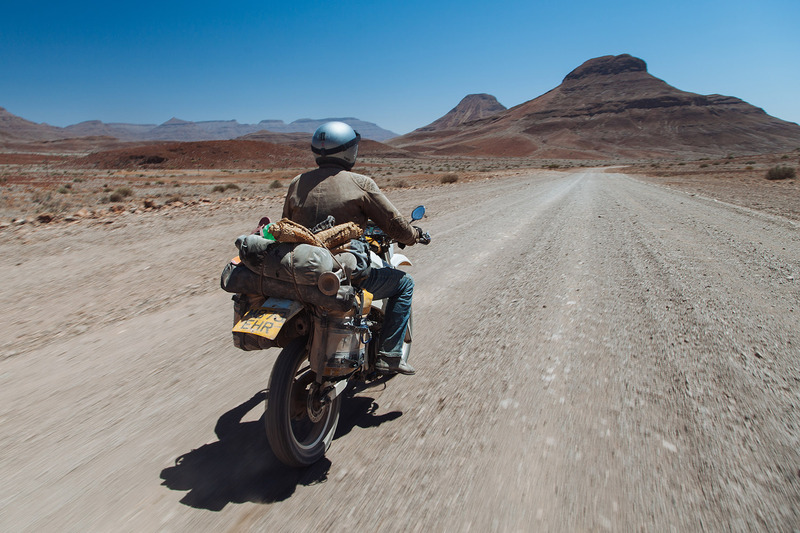 Great article, fantastic images but, is there a reason why the journey cuts off at dinner in Namibia and doesn’t follow the trip through to SA? Would love to read more! Wow what a cool adventure you went on! Definitely a once in a lifetime experience. Great adventure! I like the Picture of the bikes on the boat. Wow.. Just wow. I’m inspired and jealous you can do such adventure. I love it your post and photographs are really amazing. Thanks for sharing this post. This is such a great article. Seems like bike ride will be more fun there. Also the night under the tree was mesmerizing.